The Birmingham Enterprise Community (BEC) held an exciting launch event on Thursday 30th January, at Birmingham Business School. The evening was run in partnership with Enterprise Nation, whose founder Emma Jones spoke at the event and marvelled at the passion of the student entrepreneurs in the room. Andy Street, Mayor of the West Midlands Combined Authority, joined in the conversation and outlined the developments happening in the West Midlands making it such a go-to place for businesses. The BEC is a University student-led collaborative project with a focus on developing enterprise skills and collaborative links between student bodies, featuring participation from five Universities from the Greater Birmingham and Solihull Region. (Aston University, Birmingham City University, Newman University, University College Birmingham and University of Birmingham). The group was created by a collective of students, supported by staff from the BSEEN start-up programme. Daniel Evans the key driver behind the organisation and the current Chair, opened the evening with a passionate plea for greater community working in these divided times in order to effect change. He shared a vision for the future where students are encouraged to channel their curiosities, play, experiment, get creative, seek opportunities, tackle problems and question what they are told. He stressed the importance of celebrating success stories in the region and beyond. The BEC aims to provide a platform for young people to experience the close networking ties seen at events around the region, as well as build a hub of cross-university start-up groups – boosting not only entrepreneurial skills and thinking, but also widening the understanding of how intrapreneurial skills can help the region’s employers to innovate. 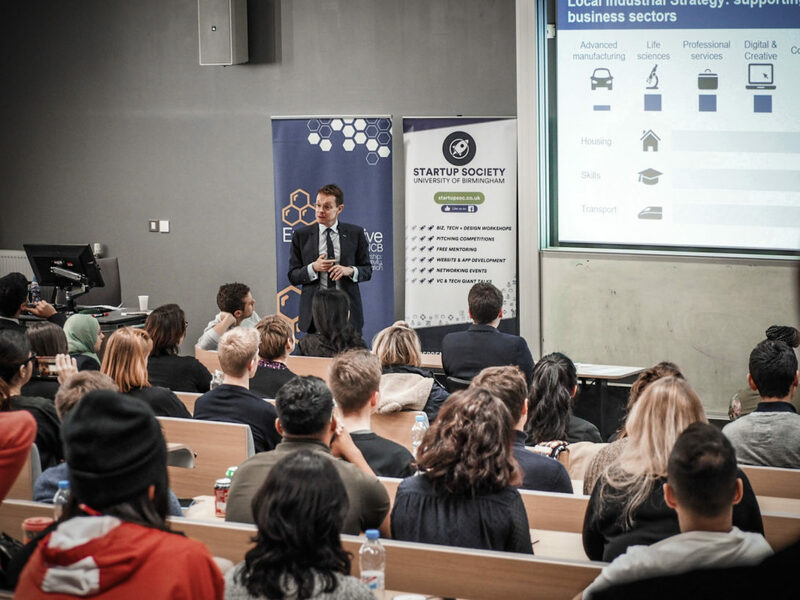 Also speaking on the night were Yanting Zuo founder of Talent Trending a platform enabling students and recent graduates to showcase their talents, who sponsored the refreshments for the evening and James Elder who founded the company Student Beans whilst at university. The BEC are now turning their focus to deepening the conversations between students, the five universities in the city as well as policy makers and the business community within the region.